Nguyen Manh Quan, director of the Ha Noi Department of Planning and Investment, talks to Hà Nội Mới (New Ha Noi) newspaper about his department’s resolve to pioneer online business registration. Can you tell us about some of the successes Ha Noi authorities have achieved in encouraging new enterprises to register their businesses online? 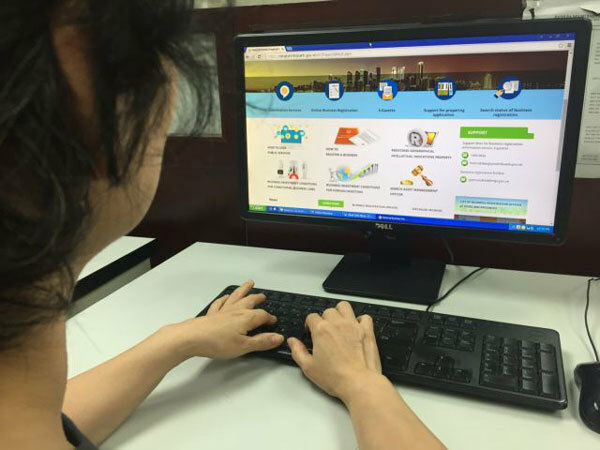 The Ha Noi Department of Planning and Investment in July 2016 started a campaign to encourage new enterprises to register online. By September 2017, all new enterprises were registering online. Up to now, Hanoi is ranked first in national administrative reform. This has helped the enterprises to save a lot of time and administrative costs, particularly for start-up enterprises. In 2018, Hanoi granted registration licenses to 25,187 new enterprises with total capital of VND392.8 trillion (US$17.4 billion) – an increase of 3 per cent compared with the same period in 2017. In the first quarter of 2019, Hanoi granted new licenses to 6,265 enterprises – an increase of 15 per cent compared to the same period last year. The Ha Noi Department of Planning and Investment has been proactive in submitting proposals to authorities to encourage new enterprises to register online. The registration fee has also been slashed considerably. In addition, the Ha Noi Department of Planning and Investment has assigned staff to instruct enterprises on how to register online, particularly small and medium enterprises. To register online, all enterprises have to submit their bank accounts to the Ha Noi Department of Planning and Investment. This has helped enterprises save costs incurred in the course of business registration. In the past, it normally took an enterprise nine working days to complete their business registration, but now it’s just six days. What objectives have the Ha Noi Department of Planning and Investment set for 2019? A top priority this year is to improve administrative reform to promote investment-business activities in the city. We think this will improve Ha Noi’s Provincial Comparative Index. From 2012-18, Hanoi’s PCI rose consecutively. Hanoi’s market price index in 2018 stood at 8.2 points – ranking 6 out of 63 cities and provinces nationwide – an increase of 1.48 points – a jump of 56 steps against that of 2017. The department has vowed to cut time spent on paperwork, particularly company registration, from three days to 1 day; and business operations from three days to two days, among others.